"CRSD" redirects here. For the Oracle Cluster Ready Services daemon (CRSd), see Oracle Clusterware. For the school district in Alaska, see Copper River School District. Circadian rhythm sleep disorders (CRSD) are a family of sleep disorders which affect the timing of sleep. CRSDs arise from a persistent pattern of sleep/wake disturbances that can be caused either by dysfunction in one's biological clock system, or by misalignment between one's endogenous oscillator and externally imposed cues. As a result of this mismatch, those affected by circadian rhythm sleep disorders have a tendency to fall asleep at unconventional time points in the day. These occurrences often lead to recurring instances of disturbed rest, where individuals affected by the disorder are unable to go to sleep and awaken at "normal" times for work, school, and other social obligations. Humans, like most living organisms, have various biological rhythms. These biological clocks control processes that fluctuate daily (e.g. body temperature, alertness, hormone secretion), generating circadian rhythms. Among these physiological characteristics, our sleep-wake propensity can also be considered one of the daily rhythms regulated by the biological clock system. Our sleeping cycles are tightly regulated by a series of circadian processes working in tandem, which allow us to experience moments of consolidated sleep during the night and a long wakeful moment during the day. Conversely, disruptions to these processes and the communication pathways between them can lead to problems in sleeping patterns, which are collectively referred to as Circadian rhythm sleep disorders. Typical features of a normal circadian rhythm, including a bedtime of 22:00. A circadian rhythm is an entrainable, endogenous, biological activity that has a period of roughly twenty-four hours. This clock function is centralized in the suprachiasmatic nucleus and allows for the internal physiological mechanisms underlying sleep and alertness to become synchronized to external environmental cues, like the light-dark cycle. Although these rhythms will persist in constant light or dark conditions, different Zeitgebers (time givers such as the light-dark cycle) give context to the clock and allow it to entrain and regulate expression of physiological processes to adjust to the changing environment. Genes that help control light-induced entrainment include positive regulators BMAL1 and CLOCK and negative regulators PER1 and CRY. Humans with regular circadian function have been shown to maintain regular sleep schedules, regulate daily rhythms in hormone secretion, and sustain oscillations in core body temperature. Even in the absence of zeitgebers, humans will continue to maintain a roughly 24-hour rhythm in these biological activities. Regarding sleep, normal circadian function allows people to maintain balances of rest and wakefulness that allows people to work and maintain alertness during the day's activities, and rest at night. Some misconceptions regarding circadian rhythms and sleep commonly mislabel irregular sleep as a circadian rhythm sleep disorder. In order to be diagnosed with CRSD, there must be either a misalignment between the timing of the circadian oscillator and the surrounding environment, or failure in the clock entrainment pathway. Among people with typical circadian clock function, there is variation in chronotypes, or preferred wake and sleep times, of individuals. Although chronotype varies from individual to individual, as determined by rhythmic expression of clock genes, people with typical circadian clock function will be able to entrain to environmental cues. For example, if a person wishes to shift the onset of a biological activity, like waking time, light exposure during the late subjective night or early subjective morning can help advance one's circadian cycle earlier in the day, leading to an earlier wake time. Patients diagnosed with circadian rhythm sleep disorders typically express a pattern of disturbed sleep, whether that be excessive sleep that intrudes on working schedules and daily functions, or insomnia at desired times of sleep. For a CRSD diagnosis, a sleep specialist gathers the history of a patient's sleep and wake habits, body temperature patterns, and dim-light melatonin onset (DLMO). Gathering this data gives insight into the patient's current schedule as well as the physiological phase markers of the patient's biological clock. To measure these variables, patients wear actigraphy watches that record sleep onset, wake time, and many other physiological variables. Other supplemental ways to classify the nature of a patient's biological clock are the Morningness-Eveningness Questionnaire and the Munich ChronoType Questionnaire, both of which have fairly strong correlations with accurately reporting phase advanced or delayed sleep. Note that extreme early or late wake times are not related to a circadian rhythm sleep disorder diagnosis. Currently, the International Classification of Sleep Disorders (ICSD-3) lists 6 disorders that fall under the category of circadian rhythm sleep disorders. CRSDs can be categorized into two groups based on their underlying mechanisms: The first category is composed of disorders where the endogenous oscillator has been altered, known as intrinsic type disorders. This category will be referred to as the intrinsic disorder type. The second category consists of disorders in which the external environment and the endogenous circadian clock are misaligned, called extrinsic type CRSDs. Delayed sleep phase disorder (DSPD): Individuals who have been diagnosed with delayed sleep phase disorder have sleep-wake times which are delayed when compared to normal functioning individuals. People with DSPD typically have very long periods of sleep latency when they attempt to go to sleep during conventional sleeping times. Similarly, they also have trouble waking up at conventional times. Advanced sleep phase disorder (ASPD): People with advanced sleep phase disorder exhibit characteristics opposite to those with delayed sleep phase disorder. These individuals have advanced sleep wake times, so they tend to go to bed and wake up much earlier as compared to normal individuals. ASPD is less common than DSPD, and is most prevalent within older populations. Familial Advanced Sleep Phase Syndrome (FASPS) is linked to an autosomal dominant mode of inheritance. It is associated with a missense mutation in human PER2 that replaces Serine for a Glycine at position 662 (S662G). Families that have this mutation in PER2 experience extreme phase advances in sleep, waking up around 2 AM and going to bed around 7 PM. Irregular sleep–wake rhythm disorder (ISWRD) is characterized by a normal 24-hr sleeping period. However, individuals with this disorder experience fragmented and highly disorganized sleep that can manifest in the form of waking frequently during the night and taking naps during the day, yet still maintaining sufficient total time asleep. People with ISWRD often experience a range of symptoms from insomnia to excessive daytime sleepiness. Non-24-hour sleep–wake disorder (N24SWD) is characterized by chronic patterns of sleep/wake cycles which are not entrained to the 24-hr light-dark environmental cycle. As a result of this, individuals with this disorder will usually experience a gradual yet predictable delay of sleep onset and waking times. Patients with DSPD may develop this disorder if their condition is untreated. Shift work sleep disorder (SWSD): Approximately 9% of Americans who work night or irregular work shifts are believed to experience Shift work sleep disorder. Night shift work directly opposes the environmental cues that entrain our biological clock, so this disorder arises when an individuals clock is unable to adjust to the socially imposed work schedule. Shift work sleep disorder can lead to severe cases of insomnia as well as excessive daytime sleepiness. Jet lag: Jet lag is best characterized by difficulty falling asleep or staying asleep as a result of misalignment between one's internal circadian system and external, or environmental cues. It is typically associated with rapid travel across multiple time zones. Chronotherapy, best shown to effectively treat Delayed sleep phase disorder, acts by systematically delaying an individual's bedtime until their sleep-wake times coincide with the conventional 24-hr day. Light therapy utilizes bright light exposure to induce phase advances in sleep and wake times. This therapy requires 30-60 minutes of exposure to a bright (5,000-10,000 lux) white, blue, or natural light at a set time until the circadian clock is aligned with the desired schedule. Treatment is generally daily at the beginning, and if successful may be continued indefinitely or performed less frequently. Though proven very effective in treatment of individuals with DSPD and ASPD, the benefits of light therapy on N24SWD, Shift work disorder, and jet lag have not been studied as extensively. Melatonin, a naturally occurring biological hormone with circadian rhythmicity, has been shown to promote sleep and entrainment to external cues when administered in drug form (0.5-5.0mg). Melatonin administered in the evening causes phase advances in sleep-wake times, while maintaining duration and quality of sleep. Similarly, when administered in the early morning, Melatonin can cause phase delays. It has been shown most effective in cases of Shift work sleep disorder and Delayed phase sleep disorder, but has not been proven particularly useful in cases of jetlag. The melatonin agonist, Tasimelteon, has been approved in the US solely for the treatment of Non-24-hour sleep–wake disorder. Vitamin B12 has been reported to normalize symptoms in individuals with Non-24-hour sleep-wake disorder, Delayed sleep phase disorder, and insomnia, though it's mechanism on the circadian clock still remains unclear. Dark therapy, for example the use of blue-blocking goggles, is used to block blue and blue-green wavelength light from reaching the eye during evening hours so as not to hinder melatonin production. ^ Toh, Kong Leong (Aug 2008). "Basic science review on circadian rhythm biology and circadian sleep disorders". Annals of the Academy of Medicine, Singapore. 37 (8): 662–668. ISSN 0304-4602. PMID 18797559. ^ Dunlap, J. C. (1999-01-22). "Molecular bases for circadian clocks". Cell. 96 (2): 271–290. ISSN 0092-8674. PMID 9988221. ^ Farhud, Dariush; Aryan, Zahra (Aug 2018). "Circadian Rhythm, Lifestyle and Health: A Narrative Review". Iranian Journal of Public Health. 47 (8): 1068–1076. ISSN 2251-6085. PMC 6123576. PMID 30186777. ^ "Body Clock & Sleep - National Sleep Foundation". www.sleepfoundation.org. Retrieved 2019-04-10. ^ a b Dodson, Ehren R.; Zee, Phyllis C (Dec 2010). "Therapeutics for Circadian Rhythm Sleep Disorders". Sleep Medicine Clinics. 5 (4): 701–715. doi:10.1016/j.jsmc.2010.08.001. ISSN 1556-407X. PMC 3020104. PMID 21243069. ^ a b Zhu, Lirong; Zee, Phyllis C. (Nov 2012). "Circadian Rhythm Sleep Disorders". Neurologic Clinics. 30 (4): 1167–1191. doi:10.1016/j.ncl.2012.08.011. ISSN 0733-8619. PMC 3523094. PMID 23099133. ^ Kim, Min Ju; Lee, Jung Hie; Duffy, Jeanne F. (Nov 2013). "Circadian Rhythm Sleep Disorders". Journal of clinical outcomes management : JCOM. 20 (11): 513–528. ISSN 1079-6533. PMC 4212693. PMID 25368503. ^ a b Sateia, Michael J (Nov 2014). "International Classification of Sleep Disorders-Third Edition". Chest. 146 (5): 1387–1394. doi:10.1378/chest.14-0970. ^ Jones, Christopher R.; Huang, Angela L.; Ptáček, Louis J.; Fu, Ying-Hui (May 2013). "Genetic basis of human circadian rhythm disorders". Experimental Neurology. 243: 28–33. doi:10.1016/j.expneurol.2012.07.012. ISSN 1090-2430. PMC 3514403. PMID 22849821. ^ a b c Dagan, Yaron (Feb 2002). 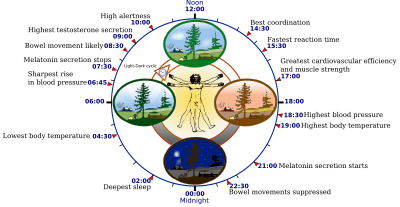 "Circadian rhythm sleep disorders (CRSD)". Sleep Medicine Reviews. 6 (1): 45–55. doi:10.1053/smrv.2001.0190. ^ Dijk, D. J.; Boulos, Z.; Eastman, C. I.; Lewy, A. J.; Campbell, S. S.; Terman, M. (June 1995). "Light treatment for sleep disorders: consensus report. II. Basic properties of circadian physiology and sleep regulation". Journal of Biological Rhythms. 10 (2): 113–125. doi:10.1177/074873049501000204. ISSN 0748-7304. PMID 7632985. ^ Food and Drug Administration (January 31, 2014). "FDA approves Hetlioz: first treatment for non-24 hour sleep-wake disorder". FDA. ^ Peuhkuri, Katri; Sihvola, Nora; Korpela, Riitta (May 2012). "Diet promotes sleep duration and quality". Nutrition Research. 32 (5): 309–319. doi:10.1016/j.nutres.2012.03.009.